My latest book, Unsavory Truth: How Food Companies Skew the Science of What We Eat, is about food industry funding of nutrition research and why it’s not good for science, public health, or trust. The book is full of examples, easily recognized by their titles. The title: Vitamin-supplemented chewing gum can increase salivary and plasma levels of a panel of vitamins in healthy human participants. Journal of Functional Foods Volume 50, November 2018, Pages 37-44. Vitaball, you can probably guess, makes vitamin-fortified chewing gum, and one of the study’s authors works for the company. Now published: my new book about how food company sponsorship of nutrition research affects public health. For information about the book—blurbs, reviews, tweets, how to get—click here. For my public speaking engagements about the book, click here. If you are in New York, join the launch party at NYU today, 5:00 p.m., Bobst Library 3rd floor. RSVP here. Oct 29 Jane Brody. Confused by nutrition research? New York Times. Oct 28 Hailey Eber. How the food industry fooled us into eating junk. New York Post, 42-43. Oct 23 Nestle M. Superfoods are a marketing ploy (excerpt). The Atlantic . Oct 22 Àlex Pérez. Una verdad desagradable no vende. ElPiscolabis (Spain). Tomorrow is the official publication date for Unsavory Truth. Here’s the launch invitation. For information about the book, click here. For my other public speaking engagements about the book, click here. I just got an advance copy of my new book about food company sponsorship of nutrition research and its effects on public health—to be published next week on October 30. To get a taste (sorry) of the book, here are the first two pages of chapter 4. If you would like to read the Sugar Association’s letter to me and my reply, I’ve included links to them after this excerpt. Want to read the rest of the letter and my reply? A leading nutritionist asks whether consumers can trust highly publicized research into whether food and beverages are healthy and safely produced. Nestle (Emerita, Nutrition, Food Studies, and Public Health/New York Univ. ; Big Soda Politics: Taking on Big Soda (and Winning), 2015, etc. ), who has a doctorate in molecular biology and a master’s degree in public health nutrition and has conducted decades of research into food producers, is perfectly positioned for this topic. She makes the convincing case that because so much of the research is paid for by industries that benefit from the results, buyers should interpret the results skeptically. 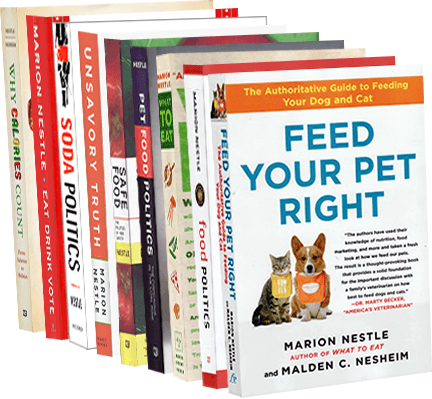 Many of Nestle’s previous books, articles, and academic studies focused on specific types of food. Here, the author turns her attention to large corporations, investigating why they pay for supposedly independent researchers, why the quality of the research might be compromised by conflicts of interests, how consumers can separate reliable science from compromised science, and why consumers should lobby legislators, government regulatory agencies, and universities for reforms regarding the disclosure of conflicts. Nestle emphasizes research paid for and disseminated by the sugar/candy industry, producers of dairy foods, marketers of meat, and—in its own chapter, “A Case Study in Itself”—the soda giant Coca-Cola. Since the author is a prolific nutrition researcher who has accepted funding that could involve conflicts of interest, she admirably scrutinizes her own policies of funding and how she discloses it. Ultimately, researchers must act as ethicists as well as scientists. When her own studies and those of fellow researchers become marketing tools for multinational conglomerates, the author admits that she feels queasy about how consumers might be misled by the marketing. On the other hand, she writes, some studies paid for by industry can be trusted scientifically—and be marketed and advertised responsibly. Nestle proves yet again that she is a unique, valuable voice for engaged food consumers. July 9 David Wineberg, “Nutrition: conflict of interest as a career,” Medium.com.